Inviting migrants and their children by post to test for hepatitis B and C in primary care settings results in the identification of a high prevalence of previously undiagnosed infections, a large randomised trial carried out in England has shown. Written invitations to test were more likely to attract older people and people of South Asian origin but young migrants were much less likely to respond to invitations to test and need to be reached by other routes, the investigators concluded. The findings were presented by Stuart Flanagan of Queen Mary University of London at the 2018 International Liver Congress in Paris on 13 April. Many European countries are striving to improve rates of diagnosis of viral hepatitis among migrant populations, who often have a high prevalence of hepatitis B or C. In the United Kingdom, prevalence of viral hepatitis can be up to ten times higher in people born in higher-prevalence countries compared to people born in the UK. In part, the models of screening depend on the healthcare systems of different countries and access to medical care among migrant populations. Screening in primary health care takes several forms: passive screening activities, in which healthcare workers offer testing as and when people attend primary care; opt-out testing, in which everyone over a certain age is tested for a condition when they attend primary care unless they opt out; and active invitation screening, in which people are invited to attend for screening with messages about the benefits of diagnosis of the condition. Active invitation, or GP endorsement, has been shown to increase the uptake of bowel cancer screening by 6% in England. The HepFree study tested active invitation screening in three areas of England with large migrant populations. The intervention invited everyone over the age of 18 from a migrant population associated with a country where the prevalence of viral hepatitis is above 2% to attend their GP’s practice to take a test for hepatitis B and C.
Crucially, GP practices which carried out the intervention received financial incentives based on the number of patients they tested. They received a payment of £25 for each patient screened. 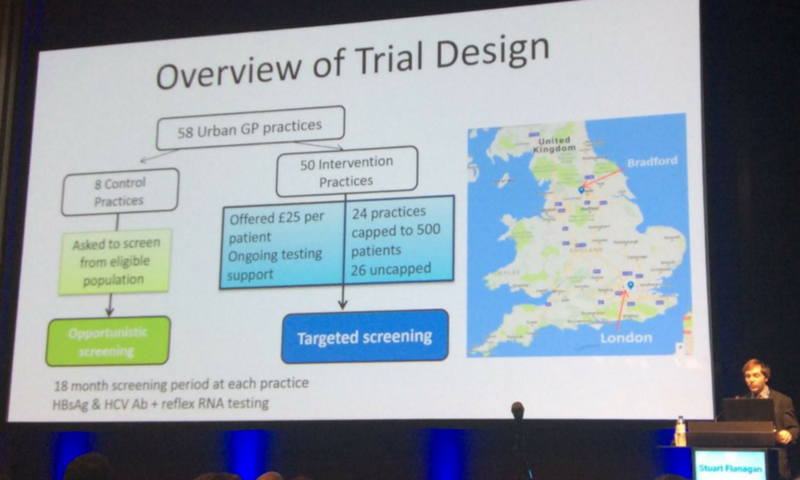 The study randomised 58 primary care practices in East and South London and in Bradford to the screening intervention (n = 50) or to carry out screening of people who attended for other reasons (the control group, n = 8). Healthcare staff at the control group practices received training on viral hepatitis and on the study. Participating practices in the intervention group were further randomised to send a standard letter to all patients or to send an augmented letter which included an information leaflet on hepatitis C in the language registered in the recipient’s clinic record as their first language. Participants were selected for participation in the study from medical records if they or their parents had been born in a country with a higher prevalence of viral hepatitis (> 2%). People previously tested for viral hepatitis were not eligible. The study identified 58,512 eligible patients who were invited for screening in intervention practices and 31,738 in control group practices. Fifty-two per cent were women, 27% of the control group and 32% of the intervention group were of Pakistani origin, 35% of the control group and 28% of the intervention group were of other South Asian origin, approximately 10% were of Black African or Caribbean origin, and the remainder were classified as 'other'. Of these in the intervention group, 11,611 attended for testing, an uptake of 19.5%. Uptake was highest in patients from the Indian sub-continent (31.8%) and lowest in Afro-Caribbean patients (8.6%). Uptake was higher in patients over 40 years of age compared to younger adults (27.8% vs 14.2%). In comparison, 555 patients were tested in control group practices, an uptake of 1.7% (p = 0.011). There was no significant difference in the uptake of testing by age in control group practices. A total of 220 infections were diagnosed in intervention practices, a prevalence of 1.9%, and 17 in control group practices, a prevalence of 3%. Prevalence of hepatitis B surface antigen was 0.9%. Of those diagnosed with chronic hepatitis B, 69% were male, 58% were South Asian and 22.6% Afro-Caribbean. The mean age of those diagnosed with hepatitis B was 46 years. Six per cent had severe fibrosis or cirrhosis. Prevalence of hepatitis C antibody was 0.81%. Thirty-eight per cent had chronic hepatitis C virus (HCV) infection. Of those with chronic HCV infection, 89% were South Asian and 15% had severe fibrosis or cirrhosis. The mean age of those diagnosed was 50 years. No cases of hepatocellular carcinoma were detected, nor of co-infection with HIV. The study found no advantage to inviting people by sending a letter accompanied by an information leaflet. A simple invitation letter from the patient's GP resulted in a similar uptake of testing. Practices were also randomised to carry out follow-up in the community or by referral to hospital. There was no substantive difference in engagement in care according to the mode; 89.8% of people referred to hospital engaged in care compared to 87.9% referred to community care for follow-up. The researchers concluded that targeting standard screening invitation letters to migrants over 40 years of age is likely to prove most effective, and that primary care practices should receive financial incentives for viral hepatitis case-finding in the same way as for some other health conditions. Flanagan S et al. HepFree: Screening migrant patients for viral hepatitis in primary care. A 90,000 patient randomised controlled trial indicates benefits are most obvious in older patients. The International Liver Congress, Paris, abstract PS-093, 2018. Journal of Hepatology 68: S51, 2018.